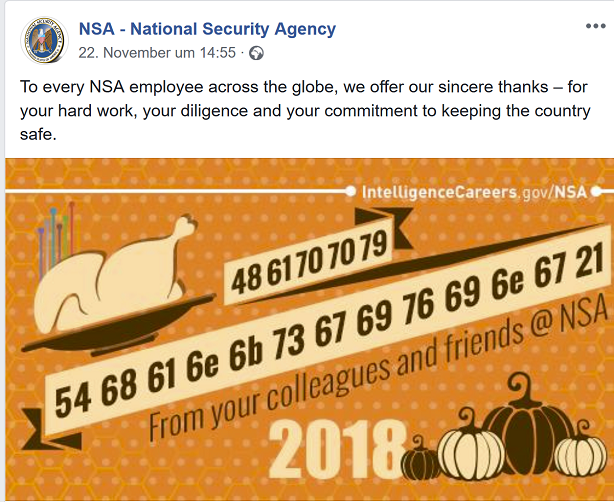 Apparently, these greetings contain two encrypted lines. According to a few Facebook comments, the solution isn’t very hard to find. Can a reader solve this challenge? 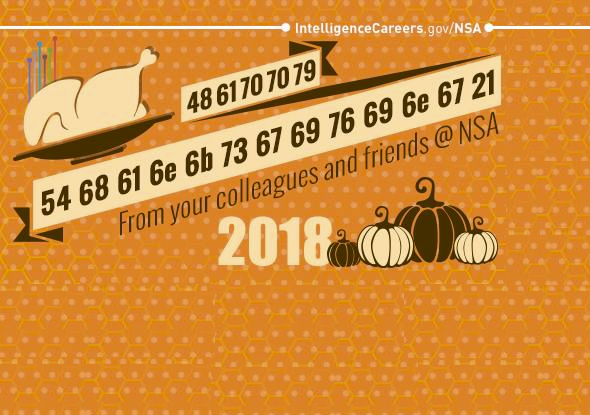 Readers who (like most Europeans) don’t celebrate Thanksgiving and who (like some Europeans) speak German might be more interested in the advent challenges of the Karlsruher IT-Sicherheitsinitiative. 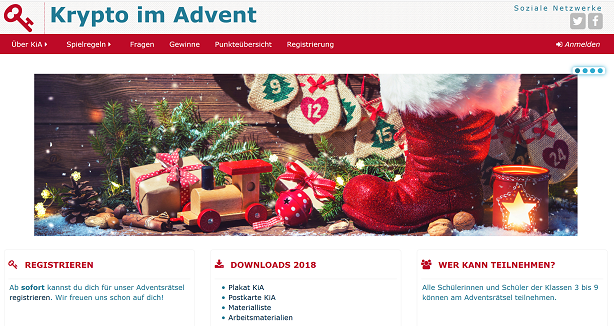 This series of crypto puzzles, titled “Krypto im Advent”, runs from Dezember 1-24. Everybody may participate, but only pupils up to the ninth grade (i.e., up to the age of about 16) can win a prize. Much to my joy, one of the prizes is a copy of my book Versteckte Botschaften- Die faszinierende Geschichte der Steganografie, which was donated by the Thalia book store in Karlsruhe, Germany. If you happen to live in the Karlsruhe area, please consider this store on your next shopping tour. That riddle qualifies for an encryption? That’s an encoding and there’s even a standard for that ;-). And, b.t.w., ok’s solution (#1) is wrong :-P.
So the question remains: What does “21” stand for? > Readers who (like most Europeans) don’t celebrate Thanksgiving…. When I heard a German ad on the radio, I first thought of stock market issues, because the “Black Thursday” is called “Schwarzer Freitag” (Black Friday) in Germany. Why is the day after Thanksgiving called “Black” Friday? @Thomas. Probably better answered by an American reader, but I believe it has to do with financial books either being “in the red” = loss, negative, or “in the black” = profit, positive. The day after Thanksgiving is the start of the Christmas shopping season, so books will (with luck) switch from being “in the red” to being “in the black”. I guess that I should add that the colours red and black refer to the colour of the ink traditionally used to write negative and positive numbers. Colin Bierton is right. I hope you all had a fantastic Thanksgiving!